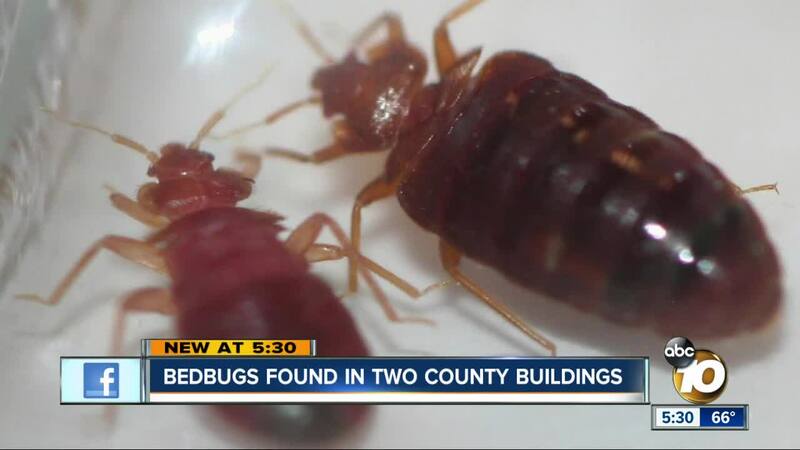 SAN MARCOS, Calif. (KGTV) - Bedbugs, the bane of many homeowners, were discovered lurking inside several San Diego County buildings last week. 10News was tipped off to a bedbug infestation at a county building: the Agricultural Weights and Measures building in San Marcos. The county confirmed to 10News, bedbugs were found there and another building from the same department in Kearny Mesa. As for how it happened, a county spokesperson revealed only that an employee is the cause and public areas were not affected. Workers from the Agricultural Weights and Measures Department, which provides pest control for the county, have laid traps, monitored for bed bugs, and moved employees to a separate area. Garrett Thrasher is Vice President of Thrasher Pest Control. He says the typical plan of attack could also involve K9 alerting, vacuuming, steam cleaning and sometimes chemical treatments. "From there, it's weekly checks to make sure there is no new activity or complaint," said Thrasher. Thrasher says bedbug calls have been increasing over the last few months and are slightly up from the same time last year.